A regular stretching program will help you stay active and independent. A loss of flexibility may not seem like a big deal as we age. After all, it's no longer necessary to do the kinds of athletic moves we did when we were younger. But flexibility is the secret sauce that enables us to move safely and easily, and the way to stay limber is to stretch. "People don't always realize how important stretching is to avoiding injury and disability," says Elissa Huber-Anderson, a physical therapist at Harvard-affiliated Massachusetts General Hospital. Flexibility declines as the years go by because the muscles get stiffer. And if you don't stretch them, the muscles will shorten. "A shortened muscle does not contract as well as a muscle at its designed length," explains Huber-Anderson. Calling on a shortened muscle for activity puts you at risk for muscle damage, strains, and joint pain. Shortened muscles also increase your risk for falling and make it harder to do activities that require flexibility, such as climbing stairs or reaching for a cup in a kitchen cabinet. "Warning signs that it's becoming a problem would be having difficulty putting on your shoes and socks or tucking in the back of your shirt," says Huber-Anderson. When you stretch a muscle, you extend the tissue to its full length. If you hold that tension long enough, the muscle will be longer once it relaxes again. "Stretching your muscle is similar to stretching an elastic band," says Huber-Anderson. "The elastic's resting length becomes longer." It's a good idea to speak with your doctor before you start a stretching program, especially if you have chronic conditions that affect your muscles and joints, such as arthritis or Parkinson's disease. It's crucial to warm up the muscles before you stretch them. That means getting blood and oxygen to the tissue to make it more pliable and amenable to change. If you don't warm up, a stretch can damage the muscle fibers. One way to warm up is dynamic stretching. "This is when you move a joint through its available range of motion repeatedly, without holding a position," says Huber-Anderson. Types of dynamic stretching include rolling your shoulders, lifting your knees, and sweeping your arms out to the sides and up to the ceiling repeatedly. Huber-Anderson recommends two to five minutes of dynamic stretching. Then you'll be ready for the types of stretches that will help you regain flexibility, known as static stretching. These stretches are held for 10 to 30 seconds. Don't bounce—that can cause injury. Note: An aerobic or weight-training workout can also prepare the muscles for static stretching. However, static stretching should not be performed before a workout, when the muscles aren't ready. 1. 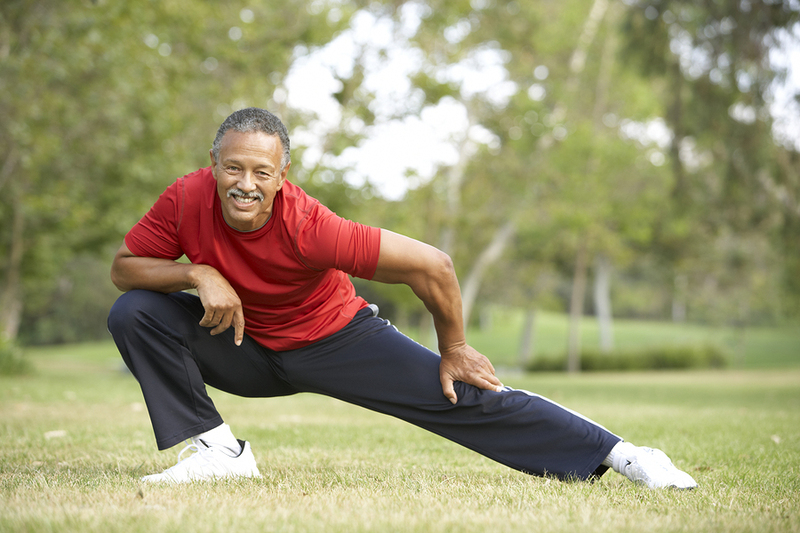 Get your doctor's okay before starting a stretching regimen. 2. Do two to five minutes of dynamic stretches before beginning a program of static stretches. 3. Try some of the stretches we've selected for you on page 5. 4. Stop stretching if you feel pain, beyond a mild burning sensation in the muscle. 5. Stick with the program. It won't magically restore flexibility overnight. In time, and with regular stretching, you'll feel the results of a successful regimen. Starting position: Sit up straight on a chair. Put your left hand on your right shoulder. Cup your left elbow with your right hand. Movement: Roll your shoulders down and back, then gently pull your left elbow across your chest as you extend your left arm. Hold. Return to the starting position, then repeat on the opposite side. This is one rep.
Keep your shoulders down and back away from your ear during the stretch. Starting position: Sit up straight on a chair with your feet flat on the floor, hip-width apart, and your arms at your sides. Movement: Slowly rotate your head and torso to the right side, placing your left hand on the outside of your right knee and your right hand next to your right hip. Hold. Slowly return to the starting position. Repeat to the opposite side. This is one rep.
As you rotate, keep your hips squared and facing forward. Starting position: Stand up straight with your arms at your sides. Movement: Extend your right leg straight in front of you, heel grounded on the floor and toes pointing to the ceiling. Place your hands on your upper thighs for support and hinge forward from the hip, keeping your spine neutral. Hold. Return to the starting position. Repeat with the other leg. Stretch to the point of mild tension, not pain. You should not feel any pressure behind the knee or at your back. Movement: Relax your shoulders against the floor. Bend your right knee. Rest your hands on the back of your thigh and pull your knee toward your chest. Flex your left foot and press the thigh and calf of that leg down toward the floor as you do so. Feel the stretch in the front of your left hip and top of your thigh. Hold. Return to the starting position and repeat with the other leg. This is one rep. When holding the stretch, remain as still as possible, without bouncing. Starting position: Lie on your back with your knees bent and feet together, flat on the floor. Arms out comfortably to each side at shoulder level. Movement: Tighten your abdominal muscles and lift both knees toward your chest, then lower them to the right side on the floor. Keeping your shoulders relaxed and pressed into the floor, look in the opposite direction. Feel the stretch across your chest and torso. Hold. Bring both knees back to center and return your left foot, then your right foot, to the floor. Repeat in the opposite direction. If necessary, put a rolled towel between your knees to make this stretch easier. Starting position: Position yourself on all fours, hands shoulder-width apart, legs hip-width apart, and fingers extended. Movement: Exhale as you lift your knees off the floor, straightening your legs without locking the knees until you are in an upside-down V. While maintaining a neutral neck and spine, align your ears with your biceps. Try to keep your weight evenly distributed between your hands and feet. Press your heels down toward the floor while keeping your shoulders down and rolled back. Hold. Return to the starting position. Soften your elbows and keep your shoulders down and rolled back as you lengthen your spine. Brace your abdominal muscles. If necessary, bend your knees slightly and let your heels come up off the floor.